This story is part of a three-part series on the rise and fall of Cincinnati's prominent beer-driven economy. The series is part of WCPO's beer month celebrating the Queen City's beer heritage and bright future as a booming brewery town. CINCINNATI -- Back in 1902, when Carrie Nation was busting up saloons with the swings of her ax during the temperance crusade, she arrived in Cincinnati determined to leave her mark in splintered bar tops and broken windows. But Carrie glanced up and down Vine Street, started counting the 136 saloons on that one street alone, and fled in retreat without taking one swing. She later confessed that she “would have dropped from exhaustion” in the first block. That was the golden era of beer and breweries in Cincinnati and Northern Kentucky. For decades before and after the turn of the 20th century, Cincinnati was one of the beer-drinkingest, beer-brewingest cities in America. In 1893, the average beer consumption here was 40 gallons for every man, woman and child – 2 1/2 times the national average. And Cincinnati drank mostly what Cincinnati brewed. 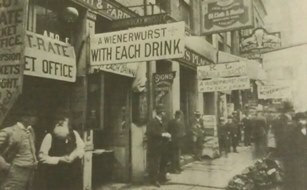 In the 19th century, a large immigration of German brewers and beer drinkers created a new industry, a new social culture centered in hundreds of saloons and a thriving new community in Over-the-Rhine. 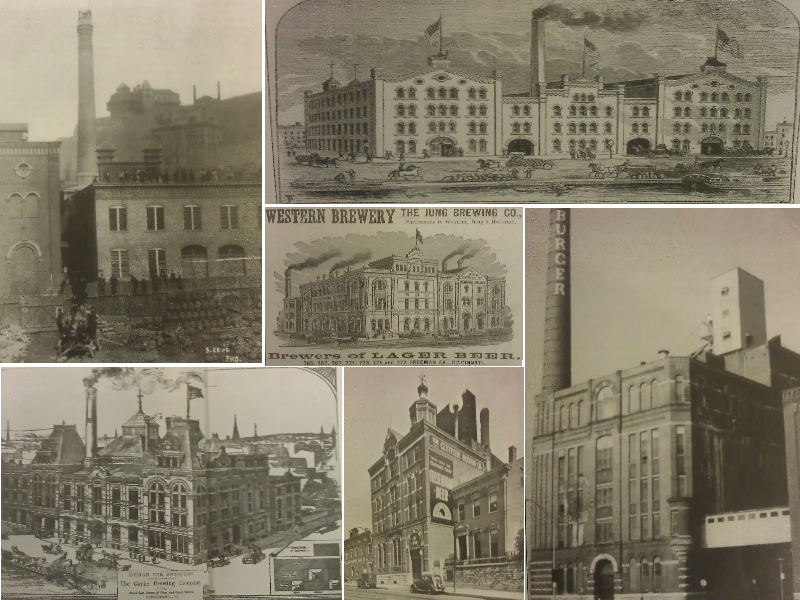 As the beer boom marked a new era of growth for the Queen City, it gave rise to giants of industry, huge and statuesque breweries that became city landmarks and popular brands like Christian Moerlein, John Hauck, Lion and Hudepohl in Cincinnati, Wiedemann in Newport and Bavarian in Covington. Big local breweries established a rich, proud heritage – only to meet their demise in the 1960s, 70s and 80s. To use a baseball analogy, think of it as the Cardinals and Brewers spending so much on player salaries that the Reds couldn't compete. The brewing giants – notably St. Louis’ Anheuser-Busch, Milwaukee’s Miller and others - out-spent, out-produced and out-marketed Cincinnati’s breweries and eventually overcame local brand loyalty. Local breweries didn’t help themselves with bad decisions. To save money, Burger stopped using city water and drew from an artesian spring under the brewery. Loyal customers hated it. Except for Schoenling and Hudepohl, which had a unique and popular international award-winner when it revived Christian Moerlein Cincinnati Select Beer in 1981, local breweries failed or were late to create new niche products or adapt to customers’ changing tastes and demands. Although Hudepohl had a successful light beer (Hudy Delight) that became the brewery’s biggest seller, it didn’t hit the market until three years after Miller Lite took the country by storm in 1975. By then, Burger had already stopped production in 1973. Hudepohl bought Burger’s assets, but Hudepohl didn’t introduce Burger Light until 1980. In Northern Kentucky, Bavarian (1966) and Wiedemann (1983) surrendered ownership to out-of-state interests and eventually succumbed because of outdated facilities and market forces. Of the big Cincinnati breweries, only Schoenling is still in operation on Central Avenue, and it was bought out by Boston Beer in 1996. Large shells of the Hudepohl and Bavarian buildings remain, but Burger is gone except for an annex now used by the Cincinnati Ballet, and the once-elegant Wiedemann was demolished for a new Campbell County jail and retail stores. The castle-shaped Bavarian brewhouse lived an after-life as a microbrewery, restaurant and entertainment center from 1996 to 2006. Steve Hampton and other preservationists are trying to maintain the brewery buildings in OTR and draw attention to them and the tunnels with markers and tours. Hampton formed the Over-the-Rhine Brewery District Community Urban Redevelopment Corporation in an effort to find uses for those buildings and contribute to the total revitalization of the neighborhood. And Greg Hardman and a new generation of brewers are doing their best to revive the city’s proud brewing history with microbrews and craft beers. Hardman built the Moerlein Lager House at The Banks and revived the best-known Cincinnati brands - Christian Moerlein, Hudepohl, Burger and Little Kings - as a well as 63 others. In 2013, he restarted brewing operations at 1621 Moore St. in Over-the-Rhine at the former site of the historic Kauffman Brewery. But long before Hardman's and others' efforts, there was a reputation about this town. While Cincinnati had established itself as Porkopolis and the gateway of commerce to the West in the early 1800s, the whiskey trade became popular and more profitable by 1881. Ten years later, the export value of whiskey and beer together topped $39 million – almost twice as much as livestock. Historians say that Davis Embree, an Englishman, opened Cincinnati’s first brewery near the riverfront in 1812 – more than 200 years ago – and that another 250 breweries opened and closed since. According to local historian Robert J. Wimberg, the first German brewery in Cincinnati opened in 1829 at roughly the corner of McMicken Avenue and Elm Street. 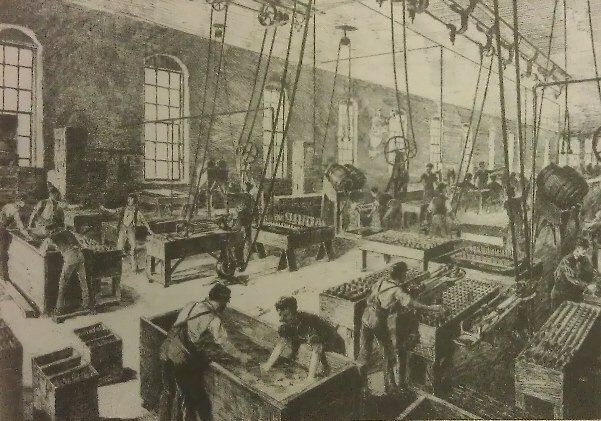 The site eventually became home to the Jackson Brewery in the 1850s and operated nearly 70 years until Prohibition. The wave of immigration from Germany started in the 1830s when persecution ramped up in Deutschland and civil liberties were under attack. Spurred by Germans who brought their love of beer and brewing know-how, about three dozen breweries were operating in the area as early as 1856. With the introduction of better-tasting lager beer in the 1850s, beer drinkers increased their demand. Lager became the beer of choice and the brewery industry grew three fold in a decade. 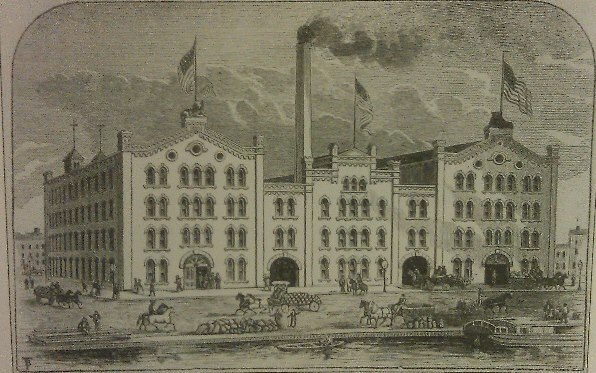 John Kauffman’s Vine Street Brewery opened in 1860 and became the city’s fourth largest. After Kaufmann’s closed during Prohibition, it became the Husman Potato Chip factory. The Christian Moerlein Elm Street Brewery grew from a side business at his blacksmith shop to the largest brewery in Ohio and the fifth largest in the country. Moerlein’s was a rags-to-riches brewery story. A native of Bavaria, he walked 300 miles to board a ship to America. He arrived nearly penniless and had a limited understanding of English. His first job was digging ditches. Besides making a better beer, Moerlein was one of the first local brewers to take advantage of pasteurization and ship his beers to other markets. To keep his beer as fresh as possible, he shipped it in barrels and had the beer bottled where it was to be sold. He shipped to such faraway cities as Boston, New Orleans, Pensacola and Omaha, and even to Cuba, Puerto Rico, Panama and the Philippines. In 1875, Moerlein bought the first ice machine in Cincinnati, cutting ice and labor costs and allowing faster fermentation. By 1888, every brewery in the city had followed suit. Moerlein’s production more than doubled in a decade from 100,000 barrels in 1880 to 225,000 in 1890. By 1890, Christian Moerlein and Windisch-Muhlhauser had become industry giants, and some 20 local breweries were producing 1.1 million barrels - or nearly 36 million gallons. Incredibly, Cincinnatians drank most of that. To German immigrants and their descendants, beer was part of their diet, and beer was safer than the local water in those days. Saloons became the centers of business, politics and community – for men only, that is. In 1889, the area was home to 1,841 saloons. In those days, most beer was packaged in barrels and kegs and consumed in public places – not in homes. Four hilltop resorts opened in Mount Auburn, Clifton Heights, Mount Adams and Price Hill, and those resorts and outdoor beer gardens catered to families. 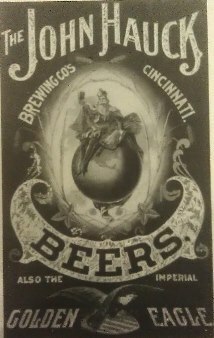 The brewing industry, with all of its associations (hops dealers, malt houses, barrel makers - known as coopers, grain dealers, saloons), employed between 30,000 and 40,000 workers in Cincinnati and Northern Kentucky at the turn of the century. According to historian Sarah Stephens, breweries paid workers $1.50 per day for 14-16 hours’ work - plus all the free beer they could drink. In 1879, a New York Times article said workers at one local brewery averaged an astonishing 35 glasses a day. That may or may not have included the women and children who worked in non-technical areas like the bottling facility - and for less pay than men. Beer brewing gave rise to a thriving Over-the-Rhine, totally unlike the neighborhood of poverty and crime it became in the 20th century. Early German immigrants had settled near the river like everyone else, but by the 1840s, new arrivals were gravitating to open land north of the Miami-Erie Canal (where Central Parkway is now). Most of the breweries were built near the canal, which provided water access south to the Ohio River and north to the Great Lakes. Beer barons with farms in Butler County could easily ship grain to their breweries. OTR provided a land of opportunity for German immigrants. They could find work and housing from German-speaking employers (who had been immigrants themselves), as well as schools with German-speaking teachers, German-language newspapers and German societies that encouraged them to retain their customs and traditions while becoming American citizens. Those traditions included Gemutlichkeit, roughly translated as “festive hospitality.” The Germans were fun-loving people – and beer was the lifeblood of the party. Gemutlichkeit soon spread to other parts of the city – and the middle-class stigma against drinking disappeared. Beer consumption rose; whiskey consumption dropped; and a political, moral and nationalistic divide started to set in here. The anti-German hysteria that swept the country leading up to World War I got a head start in Cincinnati as early as the 1850s. As recounted by OTR historian Michael Morgan, it started with vitriol and violence in the 1855 Election Riots and exploded again in the 1884 Courthouse Riots. By 1855, OTR was a distinctly German society and German-Americans had become a political force, voting Democratic in bloc and controlling two wards. A group called the Know-Nothings (they had been a secret organization; when asked about it, members would say they knew nothing) were out to steal the election for mayor and other city leaders. The Know Nothings were openly anti-immigrant, anti-alcohol and anti-Catholic. Suspecting they were going to lose the election, a mob of Know-Nothings attacked an Irish ward and chased voters away from the polls. Then they crossed into OTR, trampled through a peaceful crowd and confiscated a ballot box with an estimated 900 votes. They grabbed another ballot box from a firehouse and destroyed 400 votes, attacking more people and causing more destruction. More attacks came the next day, but the German-Americans had armed themselves and barricaded and fortified the bridges over the canal. The two sides engaged in a gun battle and the OTR residents drove the mob off the Vine Street bridge. When Know-Nothings returned at night, the OTR residents fired a volley of bullets from all sides. The mob fled but random attacks on immigrants occurred in the city overnight. The next day, rain started and the battle stopped. By the end, as many as a dozen people had been killed. After days of heated arguments, votes in the two German-American wards were recreated by logbooks. The Democrats won the mayor’s office and other offices they would have lost without the German-American vote. But the attacks in Cincinnati left deep wounds. They sparked similar attacks in Louisville and some reports around the country portrayed them in anti-German terms, as they would 30 years later with the Courthouse Riots. Ironically, one day after the 1855 Election Riots, the Ohio Senate passed the nation’s first statewide prohibition bill. Temperance: Tempest In A Teapot Or Trouble Brewing For Beermakers? There was a temperance movement in the U.S. almost from the day the first brewery went into operation. In the beginning, advocates tried to convince people to drink in moderation. Over time, they preached that drinking was wrong for religious reasons and it was bad for families. Later, they changed tactics and started to link alcohol to crime, prostitution, debauchery, domestic violence, political corruption and the need for welfare programs. They also connected it to saloons, blaming them for moral and social decay. Because German-Americans ran the breweries, owned the saloons and drank there, the implication was obvious. As the number of saloons exploded (by 1890, there was one for every 41 adult males), people started to listen. The Ohio legislature passed tough penalties for violating the Sunday laws. Ohio had passed a law in 1831 prohibiting Sunday liquor sales, but no one in Cincinnati paid attention to it. Now the penalties were stiff fines, mandatory jail time and closure unless the owner posted a $1,000 bond. The governor wrote the mayor and encouraged him to enforce the law. When enforcement stepped up in August 1889, the Cincinnati Red Stockings were in a tough spot. They had been kicked out of the National League in 1880 for selling beer and playing on Sunday, and they were planning to seek readmission. So they stopped playing on Sunday for the rest of the 1889 season. Resorts and beer gardens went out of business. Saloons that defied the law operated at greater risk of being ticketed, and the cost of getting the beat cop to look the other way went up. While Carrie Nation and the Woman's Christian Temperance Union saw saloons as the source of all evil and Nation set out the destroy them one by one with her ax, the Anti-Saloon League began to take on the alcohol industry in Washington, rising to become a powerful political machine that elected and defeated congressmen. Major social and political changes were brewing - and that was going to be bad for the alcohol industry in Cincinnati and around the country. By the 1880s, brewery families and other successful German-Americans started leaving OTR and moving to the hilltops. For one thing, buses and inclines made it easier to commute to downtown; for another, OTR was getting overcrowded and unpleasant. Saloons and tenements dominated the landscape; there was little indoor plumbing; the streets were filthy and congested; factory smoke filled the air, and the canal was becoming a stinking cesspool. 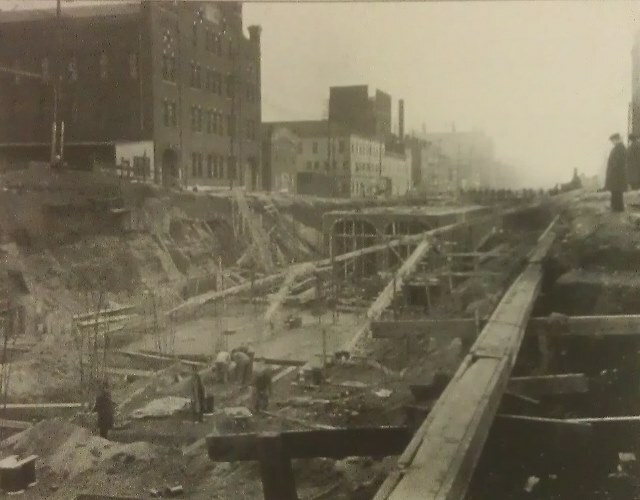 It was until 1920 that the city started draining the canal to build a subway with Central Parkway on top. Working-class German-Americans stayed, and for a while, OTR remained the heart of the German community. As World War I approached, the community rallied behind the fatherland, and residents openly opposed President Woodrow Wilson’s support for England. In Cincinnati and elsewhere, public opinion turned against Germany and German-Americans in May 1915 when a U-boat sunk the liner Lusitania, loaded with passengers and munitions. Not long after the U.S. entered the war against Germany in 1917, Cincinnati started its own war against German-Americans. Schools stopped teaching German and fired teachers. The library removed all German books, periodicals and newspapers. City Council voted to remove German names on 13 streets. The police chief required that all German songs or speeches at a German society celebration be made in English. As the war neared, dry forces whipped up anti-German fervor in the country, marking brewers, immigrants and even beer drinkers as the enemy. The government started rationing grain and coal, limiting brewery operations. In Ohio, local option laws allowed communities to vote themselves dry. By 1909, Warren and Clermont counties were completely dry, and temperance forces had a stronghold in rural communities throughout the state. In 1913, the Ohio Legislature limited the number of saloons in a city, town or township. That forced hundreds of Cincinnati saloons to close. The stage was set. In 1918, the 18th Amendment prohibiting the manufacture, sale and distribution of alcoholic beverages sailed through Congress with more than 80 percent support. It took less than a year to get ratification from three-fourths of the states. The Volstead Act created exceptions for wine, hard cider and beverages with less than 0.5 percent alcohol. States were given one year to comply. By then, the war was over and The Roaring 20s were about to begin. Prohibition added two names to Greater Cincinnati legend and brewing history. George Remus became one of America’s richest bootleggers, building a $25 million per year operation out of Cincinnati, and Carl Wiedemann, heir to the Wiedemann brewing fortune, became the fall guy in one of the biggest federal brewery busts of the dry era. Remus had been a successful criminal defense lawyer in Chicago. He decided to get in on the bootlegging action and moved to Cincinnati because of its many breweries and distilleries. Remus made hundreds of millions of dollars by building a distribution network in nine states. He had 3,000 people on his payroll. He lived lavishly with his wife, Imogene, in his Price Hill mansion, where he spent $100,000 to build a Grecian swimming pool. He also had a tennis court, a stable and a baseball diamond. The estate covered the area bordered by West Eighth Street, Greenwich Avenue, St. Lawrence Avenue and Rapid Run Road. Remus made friends with the high and mighty – some of whom protected his illegal operations. He was popular for throwing parties and giving gifts of gold, diamonds and automobiles. Remus used Wiedemann brewery in Newport to produce a lot of his beer. He owned 10 distilleries, and because he was a licensed pharmacist, he was able to buy liquor by claiming to distribute it for medicinal purposes. After he finally got caught, Remus was sent to federal prison in 1924 and served two years. While he was behind bars, his wife had a long affair with the federal agent who busted him. When he got out, Remus chased down his wife in Eden Park and shot her dead. At his trial, he claimed he was made insane by jealousy and rage. The jury bought it and Remus spent six months in Lima State Hospital, then went free. He lived in relative obscurity until he died in 1952 at the age of 79. The Wiedemann story was almost as sensational and dominated local headlines for more than a year in 1927 and ’28. Carl Wiedemann, 36, was the rich, Harvard-educated, heavy-drinking, horse-betting, womanizing grandson of brewer founder George Wiedemann. 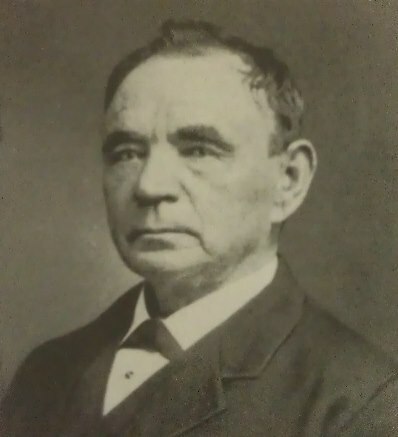 Carl served as brewery vice president under his father Charles. Besides being heir to the family fortune, he got into horse breeding and built a successful stable of 20 race horses. Carl gained notoriety in 1921 when a woman in his company fell to her death from a fifth-floor window of a Lexington hotel. According to a New York Times story headlined "Kentucky Beauty Dies in Fall," Carl said they had gone to Lexington for the races, and the woman was prone to dizziness. He said when he stopped by her room to say good night, she was sitting on the window ledge and fell out. An investigation determined her death was an accident. Carl's best horse, In Memoriam, defeated Kentucky Derby winner Zev in a 1923 stakes race that was called one of the top 10 races of all time. Carl put up $10,000 for a rematch and In Memoriam lost a 3-2 decision by judges. In 1924, Carl was reported to be engaged to Allyn King, a stage and screen actress who began in the Ziegfield Follies. But he denied that in a statement that said, “I am neither married nor engaged." King killed herself in 1930. Between his drinking, gambling and mingling with Newport’s dark underworld, Carl's life started to fall apart. When his racing luck turned sour, Carl lost most of his money and unloaded his horses. On Jan. 29, 1927, federal agents stopped a truck after it left the Wiedemann brewery and found 16 half-barrels of beer. When other agents raided the brewery that night, they found 3,500 barrels of beer ready to be shipped. The feds charged owner Charles Wiedemann, son Carl, the treasurer, the office manager, the brewmaster and six others with illegal brewing and distribution. They padlocked the brewery and seized it, along with the company’s records, which allegedly showed that Wiedemann had been illegally brewing 50,000 barrels of beer per year. To make matters worse for Wiedemann, the IRS charged the company with evading taxes. Wiedemann might not have had a keg to stand on, except that bribery allegations against federal agents and officials raised questions about the veracity of the charges. A brewery employee testified that two agents who seized the truck on Jan. 29 promised to make the whole thing go away for $15,000. And a federal grand jury indicted a prohibition administrator and three others for allegedly offering to undermine the case for $20,000. Two nights before the trial began on Feb. 6, 1928, Carl Wiedemann was arrested for driving drunk and wrecking into another car. On the second day of the trial, Wiedemann didn’t show up, and police found him drunk in a café. The judge put him in the custody of the U.S. Marshal. That day, five defendants changed their pleas to guilty and rolled on Carl. He got two years in prison and a $10,000 fine. No one else got prison time. His father, who had taken ill, got a $10,000 fine, and others were fined between $2,500 and $5,000. Carl got out after serving eight months but he never returned to an active ownership position in the brewery. Terry Balcom, a relative of founder George Wiedemann, took over as president in 1938. The IRS eased its demands for back taxes, and the feds gave the brewery back to Wiedemann for $15,000. When it reopened after prohibition, the brewery operated another 50 years. Wiedemann wasn’t the only local brewery that defied the dry laws, and it wasn’t the only one that got caught. Federal agents also raided Schaller’s and Mohawk Brewery. In fact, thousands of Cincinnatians broke the law during Prohibition. Cincinnatians had voted overwhelming against Prohibition – not surprisingly, because drinkers were so passionate and an entire industry and workers’ livelihoods were at stake. When Prohibition went into effect - on May 27, 1919 in Ohio and a month later in Kentucky - it nearly wiped out the local brewing industry. But while many closed, several carried on in secret. Bribing enforcement agents and police was easy and widespread. 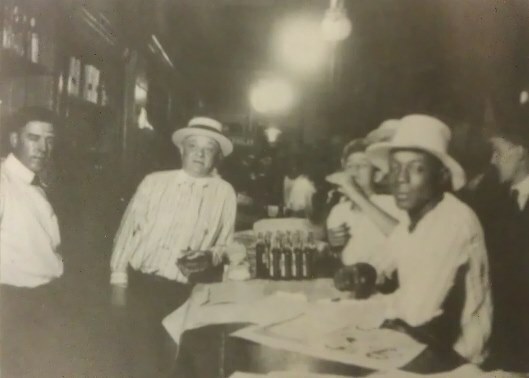 Drinking continued in large scale as an estimated 3,000 speakeasies replaced saloons, operating in the open in hotels and restaurants as well as in secret locales, selling the beer that outlaw breweries produced. Homebrewing became popular through ready-to-brew kits, and newspapers contributed by publishing how-to instructions. Prohibition was impossible to enforce, and though Cincinnati police and enforcement agents made 4,900 arrests in 1929, that was just a drop in the barrel. According to one publication, Cincinnati was the third “wettest” city in the U.S. behind New York and Chicago. There was so much clandestine brewing going on that two local malt companies, Red Top and Burger, kept up business despite the brewery shutdown. Cincinnati didn’t have the notorious gang wars like Chicago had, but there was more than enough bloodshed between bootleggers. In 1929, more than 10 killings were blamed on brewing wars. The brewery death toll included three of the pre-Prohibition giants, Christian Moerlein, Windisch-Muhlhauser and John Hauck. Moerlein closed within a week and sold off portions of its massive complex. Some tried to stay open by producing near beer (0.5 percent alcohol or less) and soft drinks. Hauck’s demise, in 1927, was marked by federal agents dumping 45,000 gallons of near beer into the sewers. It popped off the manhole covers and flooded the street. Of the city’s 800 remaining saloons, 240 immediately closed their doors. Of the other 560, some sold ice cream or soft drinks. 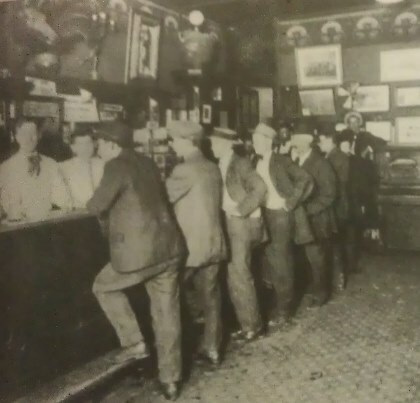 Many saloon operators turned to operating speakeasies. Prohibition devastated Over-the-Rhine. Not only did OTR lose the breweries, it lost all brewery-related businesses and jobs, even as the city lost tax revenue. 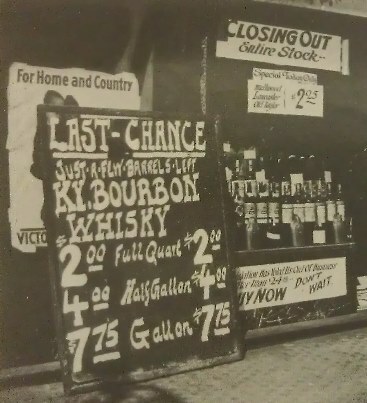 And Prohibition extinguished the last breath of community and society in OTR. The neighborhood went into drift and decline. Photos courtesy of Cincinnati Museum Center and Kevin Grace of the University of Cincinnati.